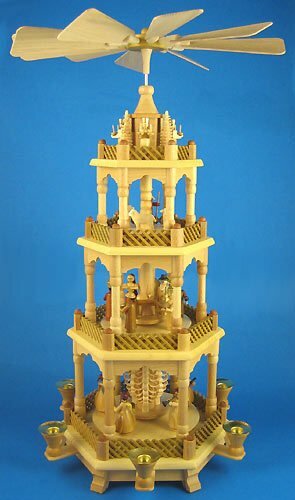 This 4 Level Nativity Christmas Pyramid has three levels that turn and is made of natural woods. The Christmas story is told from the top down with the (stationary) angels holding Candles a symbol of life and hope to the Erzgebirge Mountain Woodsman who made this Christmas Carousel. On the next level is the Shepherd in the field watching over his sheep. Next is the nativity with Mary Joseph and Baby Jesus on a stationary ledge and rotating around them are the 3 Magi with their camel. On the lowest level the angels in long gowns are playing music on their instruments. 4 Level Nativity Christmas German Pyramid stands about 22 1/2 inches tall and requires 6 medium. candles to turn. Handmade by the Artisan Coop in Seiffen Germany. German Pyramids are collectible Holiday decorations for many Germany families. These wonderful handmade Carousels can be your familys collectibles too.